Our community and our University are targeted by hackers every day. Cybercriminals are looking for any way to exploit our systems or steal our research data, intellectual property, and personal information. Our collective security depends on our individual actions: each of us has the power to protect ourselves, each other, and our institution from cyberattacks. Secure UD Training is a security awareness resource for University employees. It empowers employees by equipping them with the knowledge and skills to protect themselves, our community, and our University from cyber risks. Its modular, online, self-paced design makes it easy to complete during lunches or between emails, and the skills it cultivates are applicable throughout your life, whether at home, in the office, or abroad. greater account security through the University’s two-factor authentication (2FA) service. Phase I of 2018 Secure UD Training will be released this week and will remain available through the spring semester 2018 and summer 2018 term. Phase II will be released in October 2018 and will remain available through the fall semester 2018 and winter 2019 term. Each phase of Secure UD Training includes about 10 featured modules (or about an hour of training) plus access to our more extensive training library, including resources about securing your family and home. The new curriculum design means you won’t have to request additional modules anymore. See a module that interests you? Go ahead and take it! 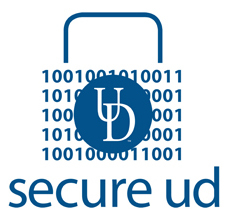 Emails about Secure UD Training will be sent on behalf of secadmin@udel.edu, the official email address of Secure UD. This is a change from previous years. If you don’t see your training emails, check your junk or spam folder. Remember, you can always log in to training through the Secure UD website; if you’re not sure about the information in a training email, you can visit the official website to log in and verify your training status. If you aren’t currently enrolled in Secure UD Training and would like to be, send email to Secure UD at secadmin@udel.edu to get access.